Meteora’s monasteries are “suspended” in the air as they are literally perched on the edge of gigantic, vertiginous cliffs. 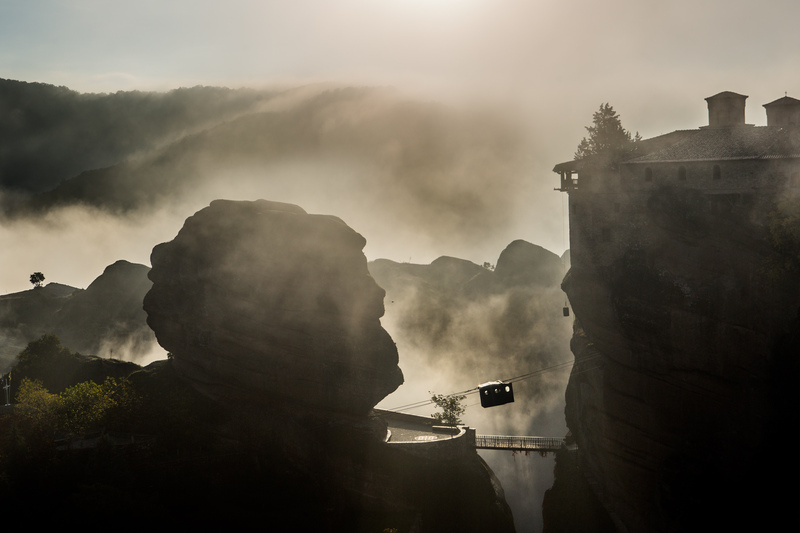 They are an extraordinary unique geological, phenomenon and one of the most powerful examples of the architectural transformation of a site into a place of retreat, meditation and prayer. 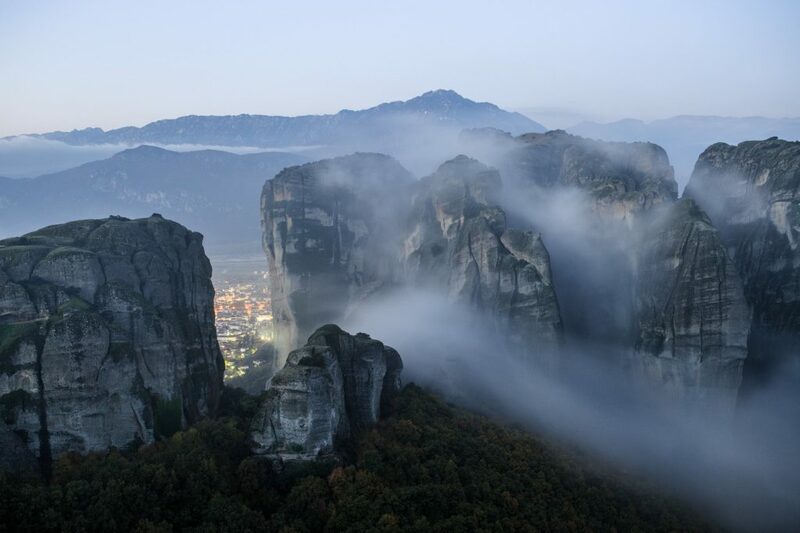 Thus, during the twentieth century Meteora was designated by the Greek government as a heritage site and in 1988 and it was recognized at an international level through its inscription as a UNESCO World Heritage Site of ‘outstanding’ cultural and natural significance. 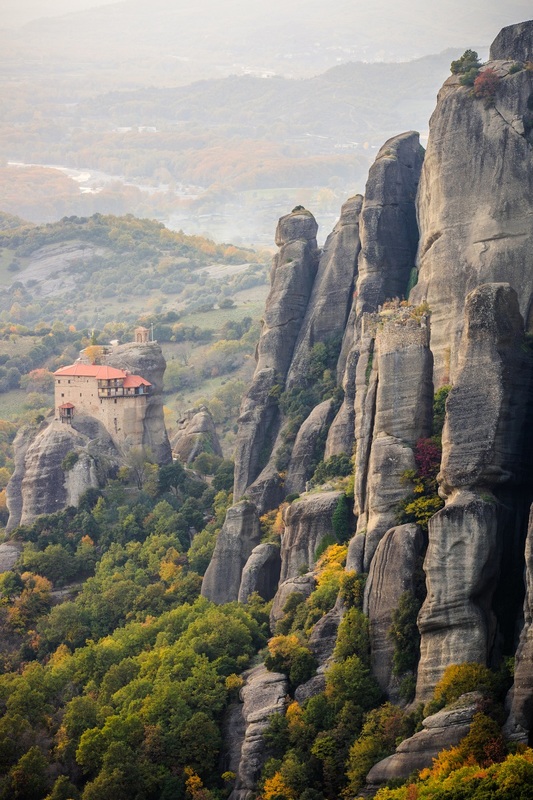 Located in the center of the Greek mainland it takes three-and-a-half-hour drive to get to Meteora from Athens. 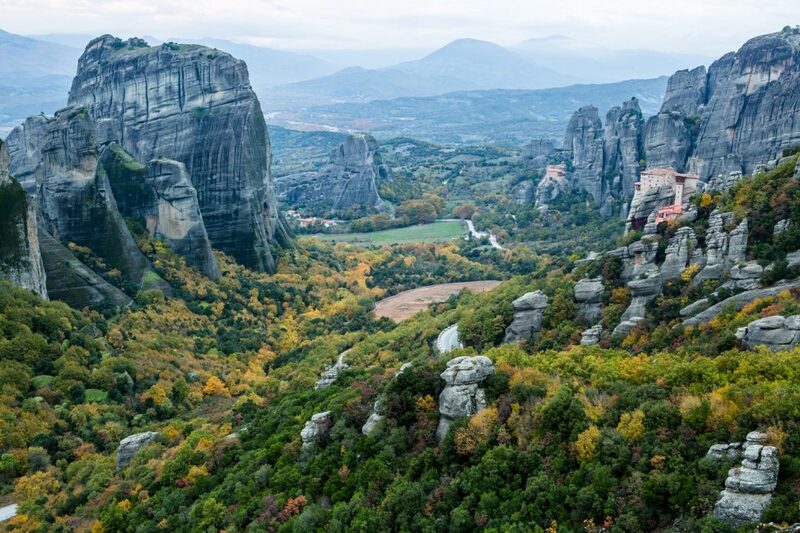 One moment you are driving through the fertile plains of Thessaly, and the next you are at the base of a gigantic “stone forest” that rise impressively above the ground. Of course, the first question which comes in mind is how these rock pillars were formed. They don’t have volcanic origin quite typical elsewhere, but the rocks are composed of a mixture of sandstone and conglomerate. The conglomerate was formed of deposits of stone, sand, limestone, marble and mud from streams flowing into a delta at the edge of a lake, over millions of years ago when the plain of Thessaly was a lake. About 60 million years ago a sequence of earth movements pushed the seabed upwards, creating a high plateau. 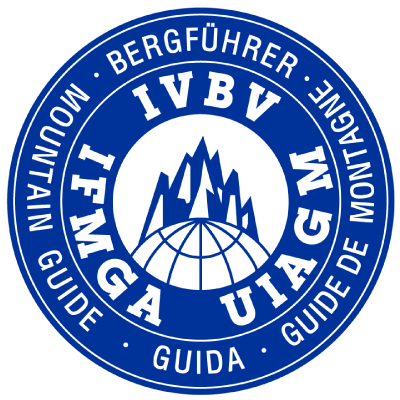 The same tectonic movements caused the flanking mountains to move closer, exerting extreme pressure in the thick layer of sandstone. Into time the rocks had weathered and eroded into fantastic shapes, isolating blocks of rock and cliffs. Where erosion was less extreme, caves and overhangs appeared in the rock face. 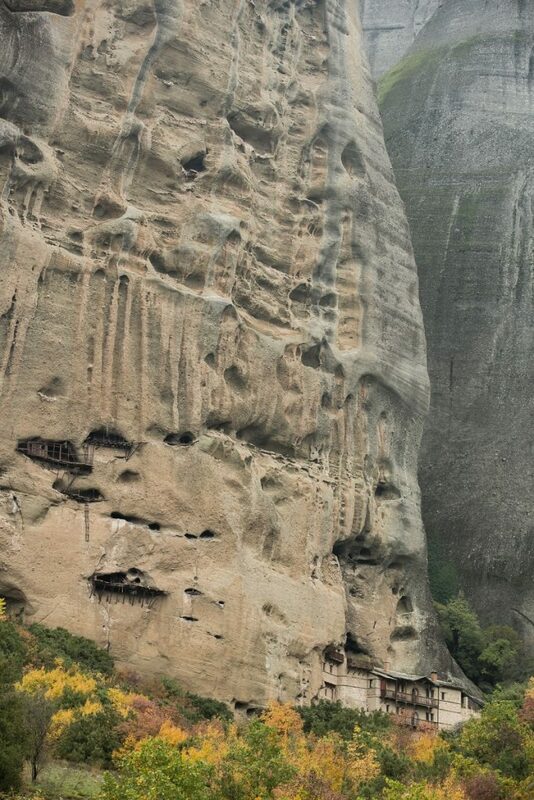 These awesome natural caves became the solitary refuge of hermit monks as early as the 9th century AD! They lived in caves and fissures in the rock towers, some as high as 400m above the plain. This great height, combined with the sheerness of the cliff walls, kept away all but the most determined visitors. 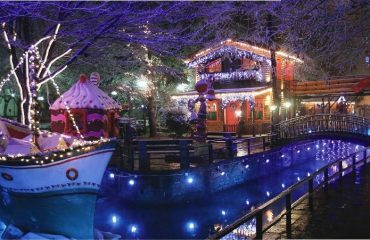 As time passed their community became bigger and in the 12th century, the first ascetic state was officially formed and established a church to the Mother of God as their worshiping center. Activities on this church were not only related to worshiping God, but hermits used these occasions to discuss their problems and exchange ideas about ascetic life. However, monasteries were not built until the 14th century when Saint Athanasios from Mount Athos established the Holy Monastery of the Transfiguration of Jesus and named this huge rock Meteoro, which means suspended in the air. 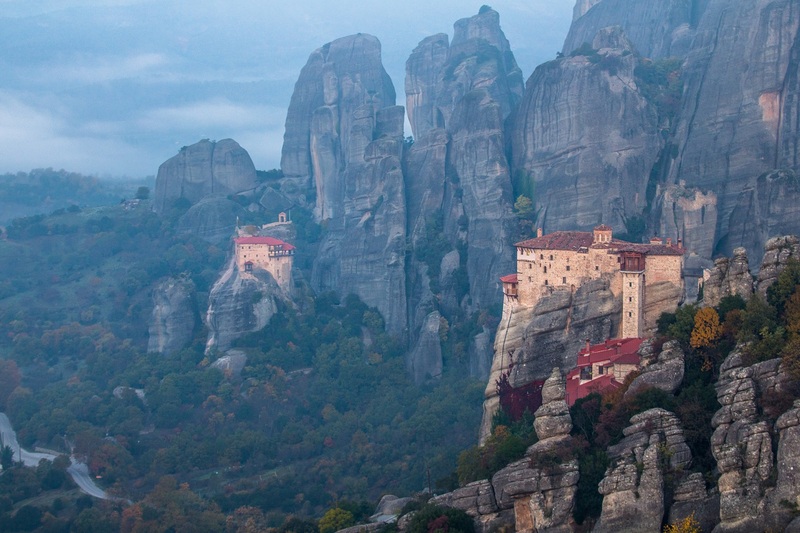 This monastery, also known as the Holy Monastery of the Great Meteoron, is the biggest and oldest one of all. 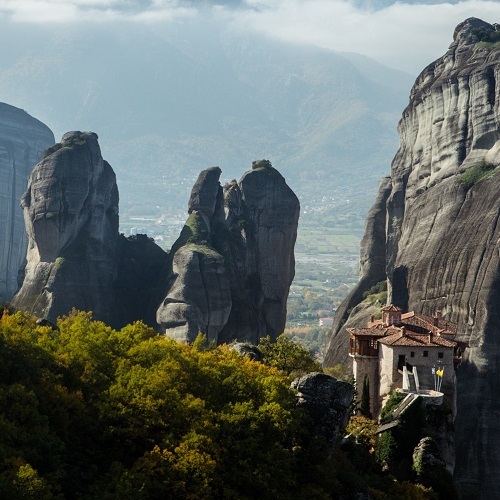 Monastic life at Meteora reached its peak in the sixteenth and seventeenth centuries, when there were twenty-four monasteries and numerous independent cells at the site. The eighteenth and nineteenth centuries were periods of decline for monastic life on the site, which reached its nadir in the first half of the twentieth century. 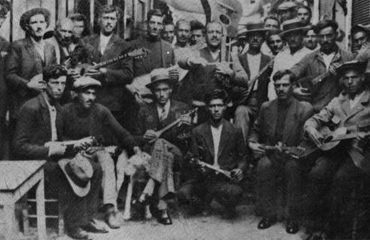 In the 1940s, under the pressure of World War II and the Greek Civil War, the monastic communities left the site, with the exception of a couple of monks who remained at the Great Meteoron and the Varlaam Monasteries. The monastic communities were re-established on the site in the 1960s and increased over time. 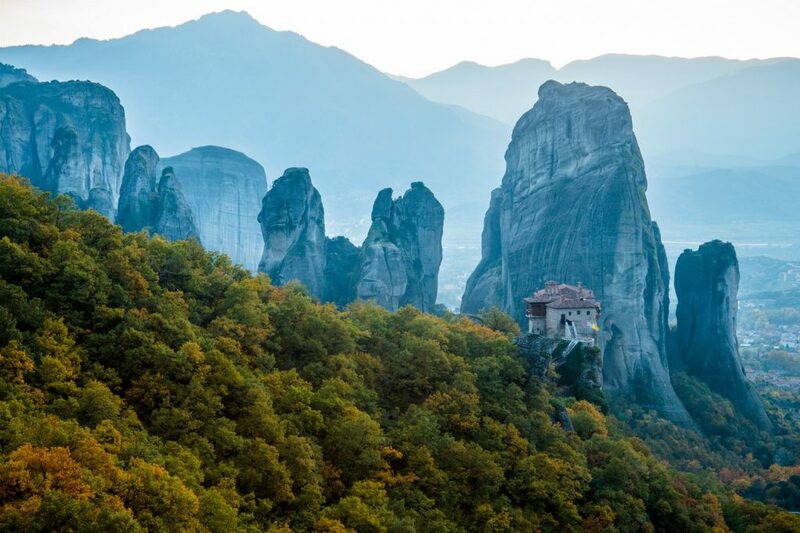 Today Meteora contains six monastic communities (four of monks and two of nuns), being one of the largest monastic complexes in Greece and in the entire Orthodox world. 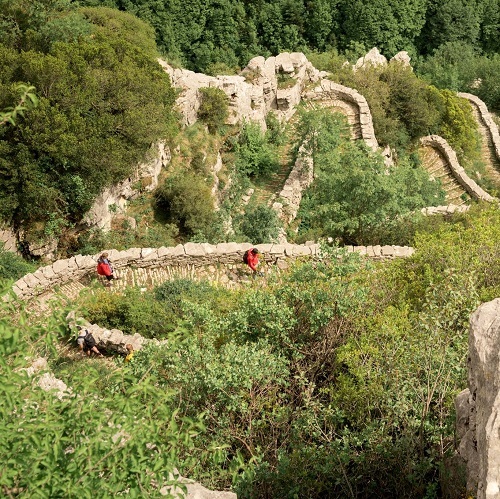 Access to the monasteries was deliberately difficult and originally requiring either long ladders lashed together, or large nets used to haul up both goods and people. 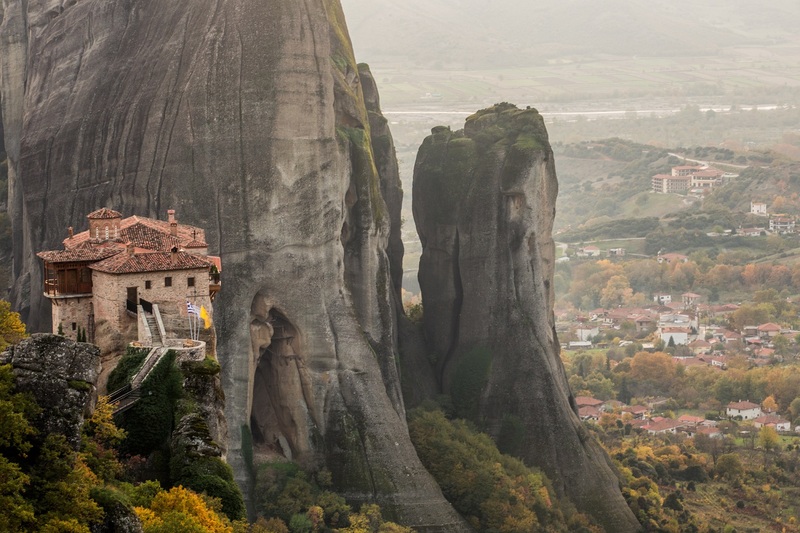 For many centuries, the monks used scaffolds for climbing the rocks and getting supplies. As years passed, this method was followed by the use of nets with hooks and rope ladders. Sometimes a basket was used, which was pulled up by the monks. Wooden ladders of 40 meters long were also one of the essential tools for accessing the monasteries.Until the 17th century, the primary means of conveying goods and people from these eyries was by means of baskets and ropes. This required also quite a leap of faith. A story goes that when curious visitors asked how frequently the ropes were replaced, the monks’ straight-faced reply was ‘when the Lord lets them break’. 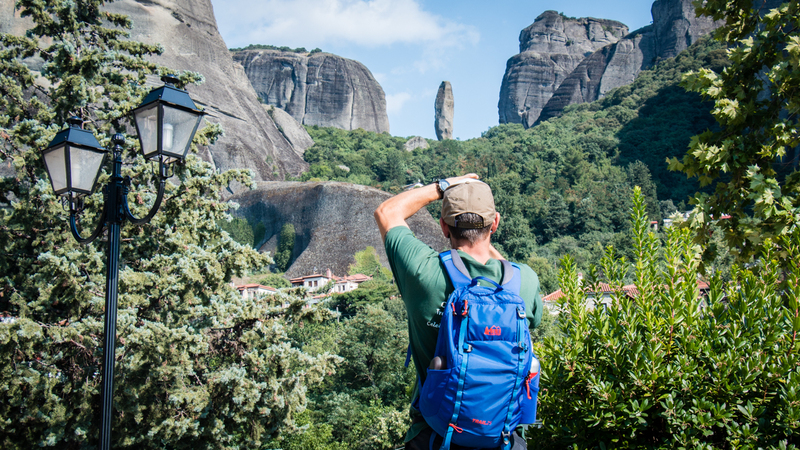 The ideal way to experience Meteora’s unique beauty is by walking. 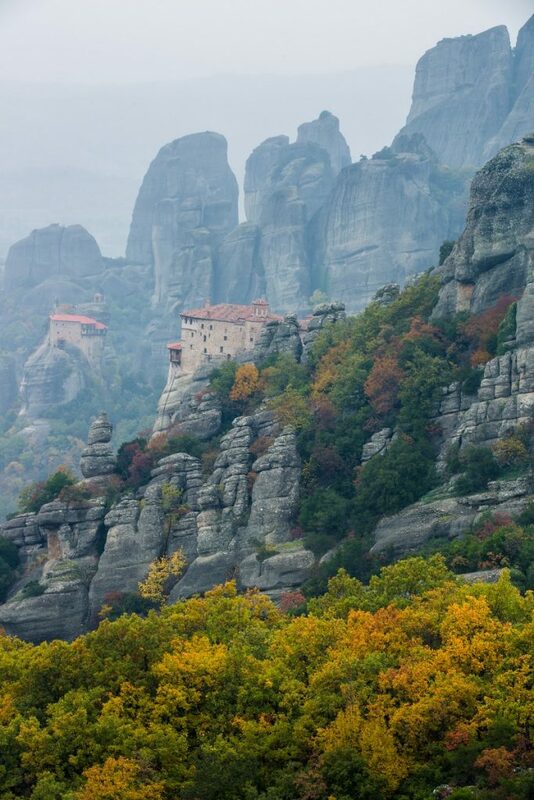 Reaching the spires by foot gives visitors a much more tangible feeling of the Meteora’s majesty. The sheer blocks of rock may look intimidating but in reality, walking around the area is not a difficult task. It is actually the only way to observe impressive rock formations, the shaping of strange patterns from a closer distance and avoid the crowds. 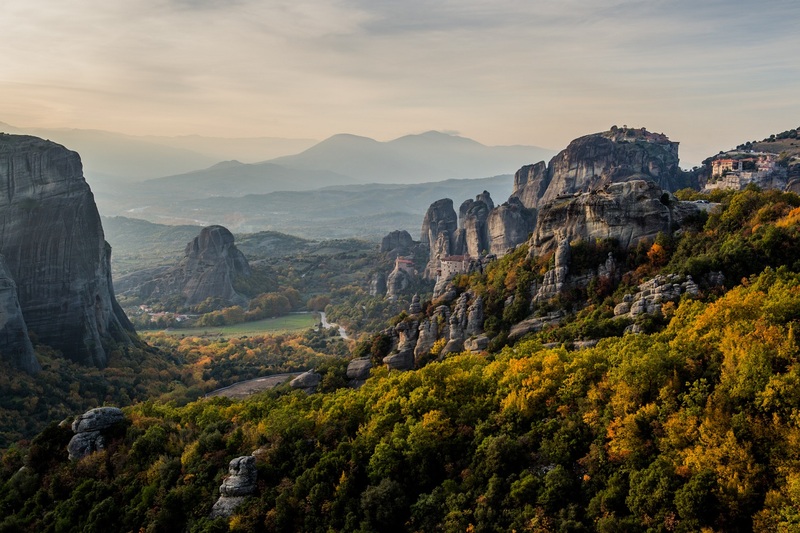 Choose a pathway, like the one from the small village of Kastraki to the monastery of Varlaam or the big loop hike which leads you to Kalabaka and back so as to take a more complete look of the area. 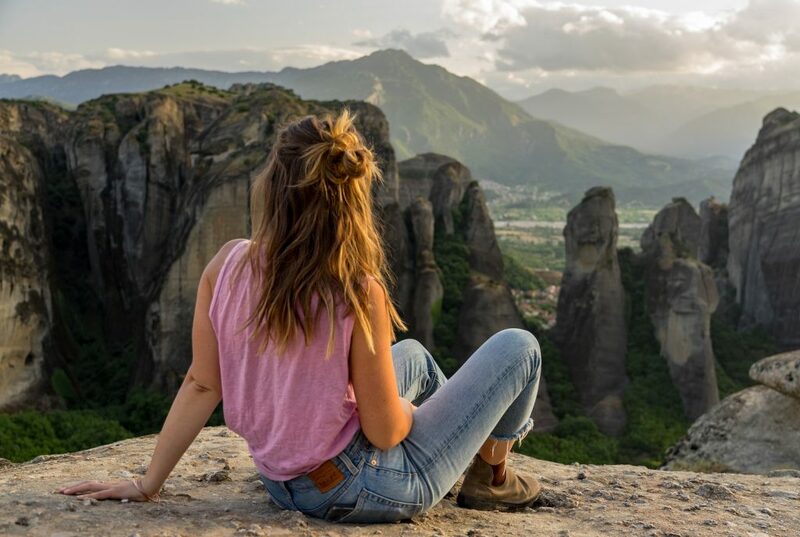 Hiking through this landscape is an unforgettable experience, offering spectacular views of the towering Meteora rocks, the monasteries and the abandoned cloisters. 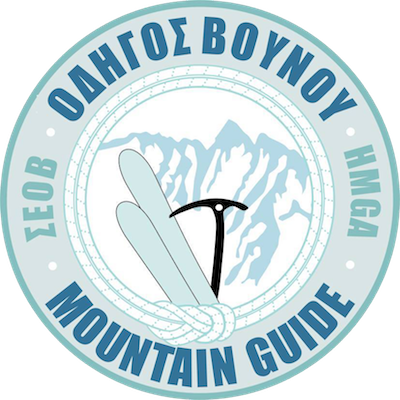 However, it is often better to be accompanied by a guide, as not all the routes are marked. 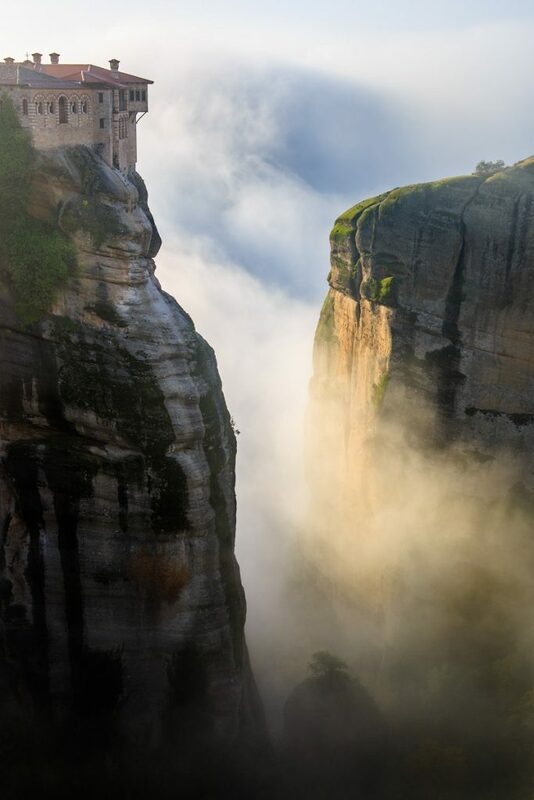 I have been going to Meteora as a visitor and hiking guide for about eight years and every time I appreciate them even more. This place is just extraordinary, overwhelming, violent and quiet at the same time. It breathes peace and serenity at every step. A unique synthesis of nature and man. The North-West corner of Greece is known for its dramatic terrain of mountains, gorges, rivers and remote settlements. 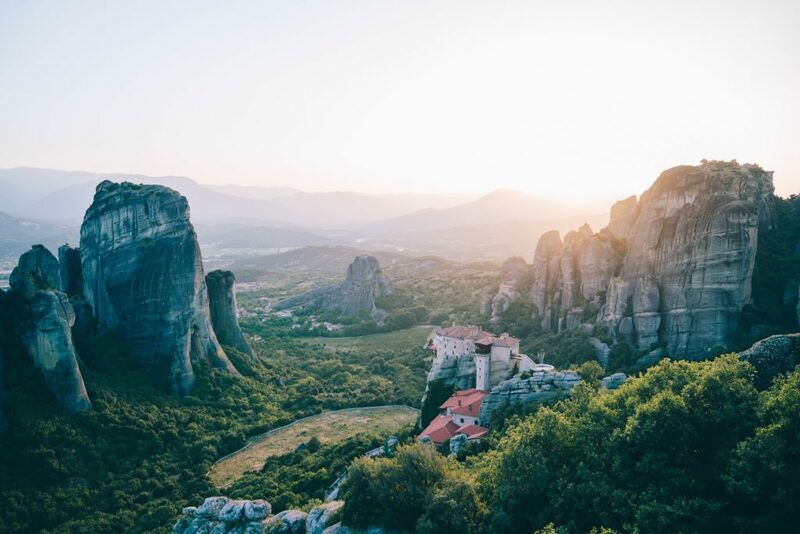 It is the most mountainous region in the country which is blessed with a lush and soaring landscape, and mountain villages to rival the best of Provence. 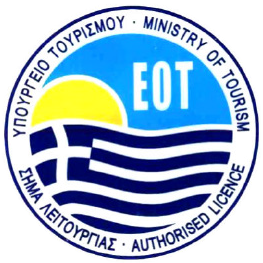 One would hardly recall many places in Europe that feel so untainted by tourism. 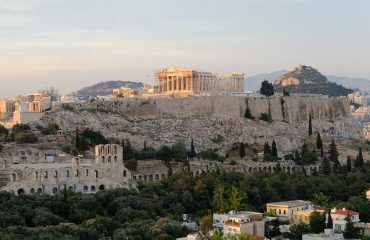 If all you have is just three days and you are trying to decide where to go before you head to the islands, this tour combines two of the most famous landmarks of Greece, Delphi and Meteora. Copyright Tripin Adventures © 2016. All rights reserved.